We're pleased to host another guest post by author and FreeREG transcriber Helen Barrell, who will feature on BBC One's Murder, Mystery and My Family this Wednesday (3rd April) at 09.15am. Here, Helen describes the usefulness of parish registers in researching the subject of her books, and the case of Sarah Chesham, who she believes suffered an unfair outcome in her trial. The cover of Helen's book: Poison Panic. Some years ago, I was researching a branch of my family who lived in Acton in Suffolk. I discovered a great-several times uncle called Mordecai Simpson who, it turned out, had been drawn into an arsenic poisoning which led to the hanging of a 17-year-old. This was the rather sad case of Catherine Foster, who was convicted of murdering her husband. The crime only came to light when Mordecai, who lived next door to Catherine, noticed his chickens dying. It turned out they’d eaten leftovers from the arsenic-laced dumpling that Catherine had fed to her husband. She was hanged in 1847. While transcribing the parish registers for Wix in Essex, I stumbled over another arsenic case – when Mary May was found guilty of poisoning her half-brother Spratty Watts (also known as William Constable). Mary was hanged in 1848, and the more I looked, the more cases of arsenic poisonings I found cropping up in the newspapers around that time. And one of the other cases was that of Sarah Chesham, who stood trial no less than three times for poisoning in 1847 and once again in 1851. Just after that final trial, when Sarah was condemned to death, an act was passed which restricted the sale of arsenic. Up until then, it was as easy to buy as an any innocent grocery, but after the act was passed, arsenic could only be purchased if the customer signed or marked the poisons register. In later years, many other poisons were added to the restricted list, including strychnine and cyanide. If you’re an avid reader of Golden Age crime fiction, you’ll have come across poisons registers in murder mysteries. But these stories are no fictions – real people died of arsenic poisonings, and real people were hanged in front of crowds of thousands of people. I was curious about the impact of the cases on the people involves and their communities and so set about researching them in detail. In 2016, Poison Panic, my book about the cluster of poisonings in Essex was published, and in 2017, Fatal Evidence, the biography of Alfred Swaine Taylor – the toxicologist who worked on nearly all the cases in Poison Panic, as well as famous nineteenth-century trials like that of William Palmer – came out. Last year I was contacted by the makers of BBC1’s award-winning series Murder, Mystery and My Family. Sarah Chesham was to be the subject of one of the episodes, and they asked me for my help. I was really glad to be involved as I’m not convinced that Sarah Chesham had a fair trial in 1851. Unfortunately, I don’t think it’s what the law would define as an “unfair trial”, because as things were in 1851, the judge presiding over the case and who sentenced her to death after she was convicted of attempted murder, had not technically done anything wrong. It’s just that morally it doesn’t seem right as the Offences Against the Person Act, under which she was tried, doesn’t include execution as a possible sentence – life imprisonment or transportation for life are the stiffest sentences possible. However, judges were allowed to sentence as they saw fit, and Campbell, the judge, decided that Sarah was guilty of the charges she’d been acquitted of in 1847 as well. Sarah had no defence counsel, and the press had been printing lurid nonsense about her too – with no money of her own, no solicitor to raise a petition, and with no Appeal Court (which wouldn’t exist until 1875) to challenge Campbell’s sentence, Sarah Chesham was hanged. Parish registers were incredibly useful for my research – not only did they inspire me in the first place to find out more about the arsenic poisonings afoot at the time, but they also helped me to reconstruct the families of those involved. In the case of Mary May, the registers were useful for finding out if the newspapers were correct when they claimed she’d had sixteen children and murdered them all – it will come as little surprise to learn that this wasn’t true at all. Over-the-top gossip surrounding the arsenic poisonings cases made their way into newspapers unchecked and were repeated and exaggerated as the stories spread. Parish registers offer us an insight into ordinary people’s lives – and when those people become part of extraordinary events, those registers can give us the facts that overblown, tub-thumping newspaper editorial of the past distorts. And so it’s fitting we filmed a scene in Clavering’s churchyard, where the very vicar who recorded Sarah Chesham’s family in his parish’s registers once stood. Helen Barrell, FreeREG Transcriber and Author of Poison Panic in Clavering, Essex. The second series of Murder, Mystery and My Family is being broadcast on BBC1 from 25th March to 5th April. The episode about Sarah Chesham airs on Wednesday 3rd April. 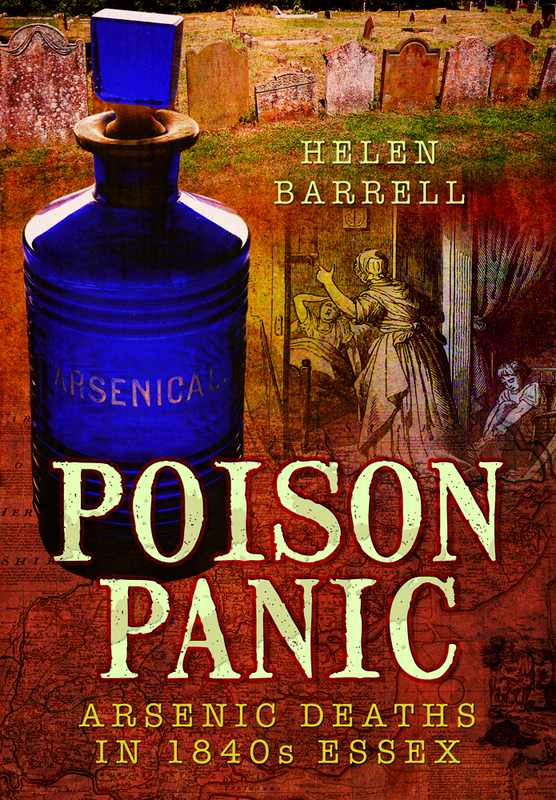 Helen Barrell’s books Poison Panic and Fatal Evidence are published by Pen & Sword and available from all good bookshops. Transcriptions for Acton, Clavering and Wix can be found on FreeREG. Here, FreeREG volunteer Ian Slater gives some background to a notable marriage record he transcribed; that of American composer Arthur H. Bird. Arthur Homer Bird was an American composer, for many years resident in Germany. Born in Cambridge, Massachusetts, he studied in Europe and spent a year at Weimar with Franz Liszt. He composed a symphony, Karnevalszene; three orchestral suites; some works for wind instruments alone; some music for the ballet; a comic opera; and some chamber music. Bird died in Berlin in 1923. A report in a Brighton newspaper from 1889 regarding a local lecture of 19th century composers states "Probably very few English musicians know anything of the American composers, Arthur Bird and E.A. MacDowell, who both received great praise". I am sure that the same can be said today nearly 130 years later. Arthur Homer Bird was born July 23, 1856 in Watertown, Mass. U.S.A. to Horace Bird (a well-known musician in the neighbourhood of Boston, where his singing schools were very popular) and Elizabeth (nee Homer). The 1860 and 1870 US Censuses show him at home with his parents and siblings(8 in 1860 and 5 siblings in 1870). His passport application in October 1874 lists Arthur as aged 18 years, 5 feet 10 ins, dark hair with light hazel eyes. In 1881 Arthur H Bird appears on the Canada Census of 1881 - an Organist from the U.S. aged 30 years residing in Ward no 2 in Halifax City, Nova Scotia. According to an emergency passport application dated September 1920, Arthur resided in Halifax, Nova Scotia from 1878 to 1888, in England from 1888 to 1890 and Germany from 1890 to present (1920). During this time he confirmed that he was in Italy and three times in the US. His purpose for residing in Germany was "studying art and music on behalf of Etude Musical paper (based in Philadelphia) and Musical America (of Chicago)”. Our interest at FreeREG concerns those few years in England. For no obvious reason the parish church in Peterborough was chosen as the location for his marriage on 29 February 1888 to Wilhelmina Drenker - a 34 year old widow. Interestingly Arthur's 1920 passport application at the American Commission Berlin stated that his wife was born in Hanover on 05 March 1858, just thirty years before their marriage. Another interesting fact is that in July 1894, Arthur applied for US passports for himself, wife Wilhelmine and 2 minor children, both born in Berlin, Marguerite (born 16 November 1875, some 12 years before this marriage) and Grace (born 14 June 1889, 15 months after the marriage). There was another passport application dated 9th December 1914 at the American Embassy in Berlin, Germany for Arthur (aged 58 years) and his wife Wilhelmine. He confirms that he left the US on 05 October 1911 and that he lives in Berlin - Dahlem following the occupation of Musician. He states that his previous US passport was issued on 18 July 1894. He adds that he is 5 feet 10 inches and now has grey hair with a white moustache. A section on this application confirms that Arthur intends "to return to the United States within indefinite five months for the purpose of protection and identification". An accompanying letter with the application says that Arthur requires the passport for "residing in Germany and returning to the U.S. by whichever route available". Arthur returned to the US on three occasions - 1899, 1909 and 1913 and was still in contact with his siblings as in March 1922 he had 3 sisters living in Upland Road, Cambridge, Mass. He was claiming that he was suffering financially. His application to the American Consular Service in Berlin states "I am the sole representative in Germany of the Musical Leader and the Philadelphia Etude both American Musical Magazines. Since the Department authorized the issuance of a certificate of identity for my continued residence in Germany in June 1920, I have not been able to return to the United States because of financial circumstances. However, the Musical Leader has proposed my coming to America this summer, if they will pay my expenses over, I will of course avail myself of the first opportunity to return. I have not at the present time, sufficient money to pay for a Departmental passport and I therefore, respectfully request that a certificate of registration be granted me". Arthur died the following year in Berlin. The FreeBMD website will be undergoing a revamp over the next few months. The new website, which will run alongside the current one, will be in line with the design used for sister projects FreeCEN and FreeREG. We want to make sure that it continues to provide the service that family history researchers know and love, whilst possibly incorporating new features that will improve your experience. We've created a survey for you to let us know how we can best achieve these goals. Click the button below to tell us how and why you use FreeBMD, and what, if any, improvements you would like to see.